Webinar for Software Organizations Who Want to Increase Training Revenues without Increasing Staff & Provide a Better Customer Experience to Boot. You’re probably using multiple systems to deliver and manage software training for your customers, partners and employees around the globe; but are you using them as efficiently as possible? You use your LMS system for managing your courses and your various training participants, and your virtual labs to provide hands-on training in real-world environments to attendees around the globe. But is your team entering the same data manually into both systems? Are your participants required to register in 2 different places? By integrating your training systems, you can make sure your training team is spending their time creating great training content rather than on administrative tasks. Your team becomes more productive, letting you provide more courses and earn more revenues without increasing staff. And we are not just blowing hot air. Customers, like software giant ForgeRock, have seen amazing results by integrating their cloud-based training systems, including the Administrate training management and LMS system, and CloudShare’s virtual training labs. 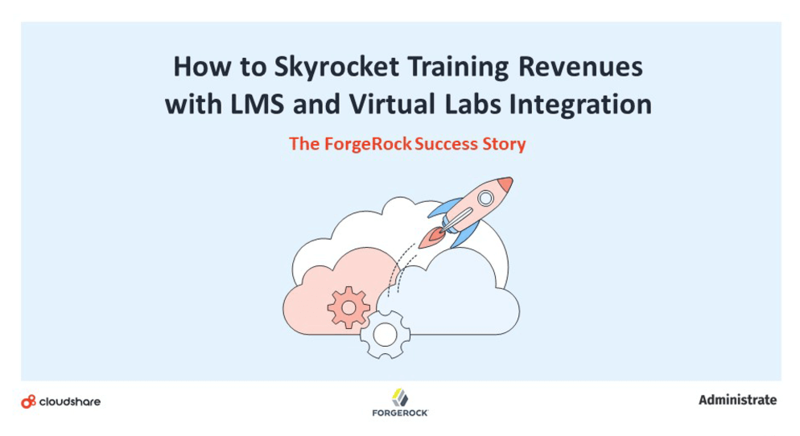 Join our webinar and hear first-hand from our mutual customer, Kevin Streater, VP ForgeRock University, how he was able to grow his training revenues from zero to $1 million dollars in one year without increasing staff. Kevin will walk us through how he built a global, distributed, virtual training operation on top of cloud training systems like Cloudshare and Administrate. And he’ll be on the line to answer any questions you have. Join us and get inspired for the New Year! Click here to register for your free place on this webinar, as spots are going quickly!